I’ve got a juicy SQL Server post for you to ring in the new year – Transparent Data Encryption, available only in SQL Server 2008 Enterprise edition. This is good and powerful stuff that works, folks, so check it out here. Sensitive information (passwords, credit card numbers, salary information, and so on) in your database needs to be encrypted. As of SQL Server 2005, you can encrypt and decrypt sensitive data columns in your tables using symmetric keys. You identify the columns that will hold sensitive information, and then invoke ENCRYPTBYKEY to store data in those columns, and DECRYPTBYKEY to retrieve data from those columns. The process is fairly straightforward, but it does require programming in your application for each encrypted column. In SQL Server 2008 (Enterprise edition only), Microsoft has added a new feature called Transparent Data Encryption (TDE). This feature automatically encrypts the entire database (data and log files), as well as database backups, without requiring any programming or code changes to your application. The process is entirely transparent, hence the name Transparent Data Encryption. In this blog post, I’ll explain TDE, and demonstrate how to use this new security feature. When TDE is first enabled for a specific database, SQL Server encrypts the database in the background. During this process, the database remains online and responsive to client requests (similarly, when encryption is disabled, SQL Server decrypts the database in the background). Encryption is performed at the page level, and does not increase the size of the database in any way. Once the entire database is encrypted, new data gets encrypted on the fly as it is written to disk, and all data gets decrypted when read back. Databases protected with TDE are encrypted with a Database Encryption Key (DEK). You create the DEK and store it in the database, but the DEK itself is associated with a certificate that you create separately in the master database. This means that a backup of the database includes the DEK, but doesn’t include the certificate upon which the DEK is based. Hence, TDE database backups are useless to prying eyes, since they cannot be restored without the certificate. Finally, the certificate itself is encrypted by the Service Master Key (SMK), also contained in the master database. To get started, you’ll need to create an SMK, if your server doesn’t have one already. Then you can create a certificate for TDE that is encrypted by the SMK which can be used to create one encrypt one or more DEKs. Finally, you create a DEK against the certificate in each database to be encrypted and then enable encryption on the database. In this diagram, you can see that the master database holds the SMK (there can be one and only one SMK on any server instance). The master database also holds a certificate whose private key is encrypted by the SMK. 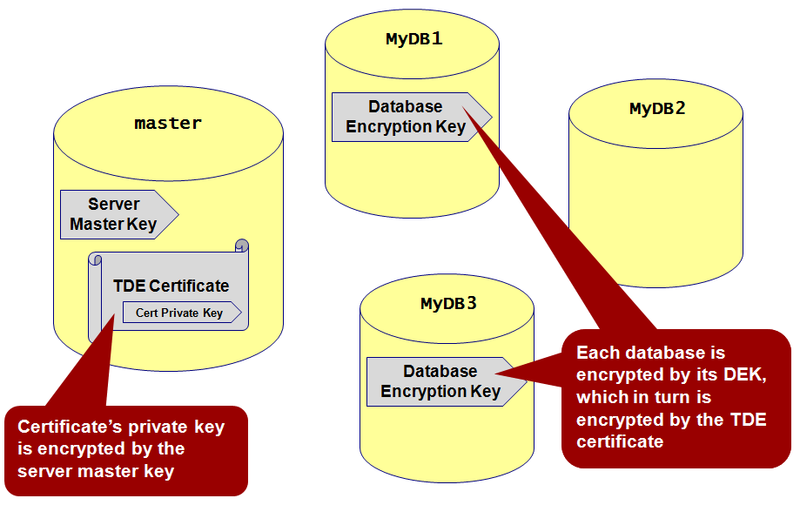 The two databases MyDB1 and MyDB3 are each encrypted with DEKs that are, in turn, encrypted by the certificate. The DEKs are entirely dependent on the certificate, so copying or restoring these databases to another server instance without also transferring the certificate upon which the DEKs are based yields a totally unusable database. Notice the ENCRYPTION BY SERVER CERTIFICATE clause that references the TDE certificate MyEncryptionCert we just created in the master database. This means that the MyEncryptionCert certificate must be present and available in the master database of the same server instance as MyDB, or the database will be rendered inaccessible. That’s all there is to it! From this point forward, the database and all of its backups will be encrypted. If an unauthorized party somehow gains access to the physical media holding any backups of MyDB, the backups will be useless without the certificate protecting the DEK. This output is somewhat misleading, however, since encrypting one or more databases results in the encryption of tempdb as well. This is absolutely necessary since tempdb is shared by all databases, and SQL Server must therefore implicitly protect temporary storage placed into tempdb by databases encrypted by TDE. But because the encryption in tempdb is implicit, is_encrypted is returned as 0 (false) by sys.databases for tempdb (you’ll see next that SQL Server does actually create DEK for tempdb). This can have an undesirable performance impact for unencrypted databases on the same server instance. For this reason, you may wish to consider isolating separate SQL Server instances; one for encrypted databases and one for non-encrypted databases. Certain database operations cannot be performed during any of the “in progress” states (2, 4, or 5). These include enabling or disabling encryption, dropping or detaching the database, dropping a file from a file group, taking the database offline, or transitioning the database (or any of its file groups) to a READ ONLY state. Also note the implicit DEK for tempdb created by SQL Server, which always uses AES_256 encryption. Cannot find server certificate with thumbprint '0x6B1FEEEE238847DE75D1850FA20D87CF94F71F33'. This statement creates two files: MyEncryptionCert.certbak is a backup of the server certificate, and MyEncryptionCert.pkbak is a backup of the certificate’s private key protected with the password Pr!vK3yP@ssword. Password protection is absolutely required when backing up the certificate’s private key. Both of these files and the password will be needed to restore an encrypted database backup onto another server or instance. At the risk of stating the obvious, these backup files and the private key password should be closely safeguarded. This statement restores the MyEncryptionCert server certificate from the certificate backup file MyEncryptionCert.certbak and the certificate’s private key backup file MyEncryptionCert.pkbak. Naturally, the password provided in the DECRYPTION BY PASSWORD clause must match the one that was used when the certificate’s private key was backed up or the certificate will fail to restore. With a successfully restored certificate, you can then restore the backup of any encrypted database whose DEK is based on the MyEncryptionCert certificate. 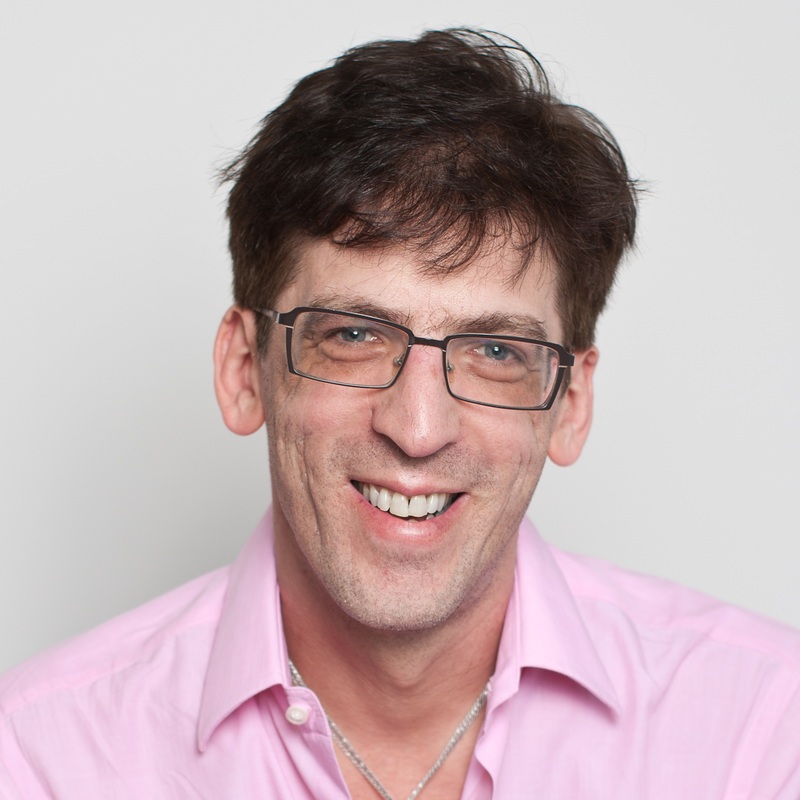 With the growing concern about personal data protection and the proliferation of computer viruses, developing a methodology for secure computing continues to be a vital task for developers. With support for Transparent Data Encryption in SQL Server 2008, you can easily implement an additional layer of security by encrypting your entire database without making any code changes in your application. Now go give it a try, and enjoy!